Today, Octavian from 1000fragrances brought over the scented card from the latest issue of Bloom, a horticultural magazine, edited by trend-hunter supreme Li Edelkoort. 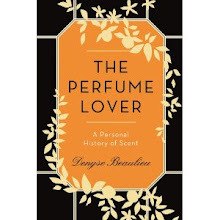 Merveille was composed by an unnamed perfumer from the Givaudan labs. 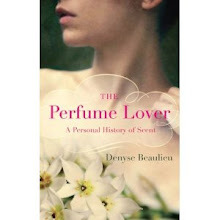 It’s a lovely abstract scent, that manages to be just about everything in the book (floral, fruity, aquatic, mineral, grassy), and gives off an impression of space and freshness. After talking around it for quite a while, and sniffing it repeatedly from the card, I thought I recognized it. Not that it exists in nature – it doesn’t. Nor that there’s a fragrance just like it – there isn’t. But Merveille is actually what I’ve been calling, in my mind, the Big White Green Bubble. I’ve been finding the Big White Green Bubble a lot in fragrances lately. I see it as the answer to a structural problem in perfumery: how to create space between notes, to give them time to meet on their own terms without crushing each other; to give them some breathing space. Aldehydes once performed a similar function: they churned up notes that could otherwise be perceived as flat and oily. The green floral notes sitting in the heart of a fragrance -- muguet and hyacinth, for instance – have also traditionally been called on to act as mediators between the top and base notes (think vintage Miss Dior). Calone and its marine-ozonic relatives put in a lot of mileage too: they now seem to trite to be used in a straight-faced way (though Bertrand Duchaufour’s new Fleur de Liane for L’Artisan Parfumeur tries to breathe new life to the aquatic genre). Lately I’ve been spotting the BWGB in lots of fragrances. The new Chanel Exclusive Beige has it, N°5 Eau Première shows a hint of it, which led me back to spotting it in Allure and Coco Mademoiselle. I can make it out in The Different Company’s neo-chypre Sublime Balkiss (though that may be cassis bud performing the same service). It's sitting smack in the middle of Karl Lagerfeld's Light and Floriental. Annie Buzantian’s super-expensive Pure Distance 1 (reviewed by Octavian and Patty of the Posse) is almost nothing but BWGB beefed up with white florals and mimosa. But any browse down the aisle at Sephora’s with a bunch of blotters will turn up a dozen examples: like Edgar Allan Poe’s Purloined Letter, it’s so obviously sitting there it’s practically invisible. Bloom’s Merveille is the BWGB in its almost unadulterated form; the Platonic ideal of space in perfume. In heaven, this is what air freshener would smell like, if air freshener were needed after a lot of seraphic wing-flapping. It could’ve been called Breathe. 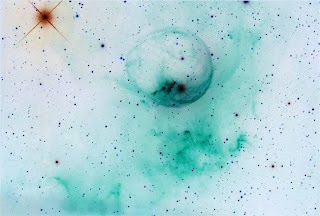 Image: NGC 7635, the Bubble Nebula, from the NASA website. hello! what an interesting idea. i'm quite new to perfume, so i don't recognize that i've smelled what you're talking about yet. but to me that is a lot of the fun - when you've read about some intriguing concept and your nose finally picks it up and it all comes together....or, conversely, you've noticed something and can't quite put your finger on it, and then you run across the perfect description. it's the interplay between the conversation between the ideas, the experiences, and the descriptions. i was reading Patty's review of pure distance (even the name of that perfume seems to echo your idea) on your recommendation and she mentions cassis as one of the notes. seeing as you mention it in sublime balkiss, maybe that is part of the way they achieve this sense of a particular structure? p.s. that was lunarose just now - darn computers! Hi Lunarose. I think the effect can be achieved with several different types of materials: one has been used since before WWI to give off a "muguet" note (hydroxycitronellal), but there are lots more. Pure Distance has cassis (blackcurrant), a fruity note; Sublime Balkiss has "bourgeon de cassis" (blackcurrant bud), a green note that smells "pissy" when undiluted. I understand exactly what you are describing, although I would have never been able to verbalize it so clearly. Like the Polo sweets, it's the hole with the mint around it ! Yeah, I think I know what you mean. It's that all-too-studied-and-posed airiness that I find to be quite characterless in recent perfumes, especially after going down the rabbit-hole into the vintage stuff. Even the good stuff, like Parfums de Nicolai's Le Temps d'Une Fete, has that posed airiness. To go off on a rant: now that I've tried a lot of vintage perfumes, contemporary perfumes so often reek of impoverished, lab-created, lone molecules rather than rich, living things of beauty, like a wine is a living thing, and like a perfume should be. OK, rant over! Aimée, if you sniff closely, you'll still find the "bubble" in the heart notes (often in the form of muguet or a hyacinth + rose combo), but it's smaller: vintage scents are denser. The "bubble" in modern scents can be either a shortcut, a signifier of freshness and airiness, or an actual structural necessity: everything depends on what you put around the bubble. There is definitely more space opened in contemporary fragrances, to suit current tastes (for "light", non-perfume-y scents) but also modern aesthetics (to give more resonance and legibility to notes and accords). As for vintage perfumes, I fell into the rabbit hole quite a while ago and now I find that I very seldom actually crave wearing them: they require much more attention. I agree many contemporary compositions are short on flesh, usually for financial reasons. Still, there are enough around to find interesting balances between synthetics and naturals. hi it's lunarose again. thanks for the information on the cassis notes. i've been percolating over the way you went about describing fragrance in this post and how much i prefer that type of description to the usual 'lists of notes' which is standard in marketing info. to begin, lots of times the notes themselves aren't specific - what part of the plant, natural or synthetic, which synthetic, and so on. to me that's like describing a painting by listing the colors! can you imagine 'well, they used cadmium red medium and alizarin crimson...' and you don't even know if it's a landscape, a portrait or abstract, much less if it's of a particular style - really that type of description lacks what we would consider the most grossly basic information about a painting. Lunarose, you'll see quite a few of us bloggers attempting to tackle the matter of structure -- the language needs to be worked on, as we're all pretty much self-taught. You should go over to 1000fragrances: Octavian has training in architecture and perfumery, and he's writing fascinating posts on perfumery schools (as we would say artistic schools) these days. Jarvis, I think you're right, it's something Roudnitska worked on, and that melon note can be part of it, though I think that Diorissimo contains the matrix of that effect. For the violet-metallic sheen, I've been noticing it a lot too, but I haven't sussed out its function yet exactly. What particular fragrances were you thinking of?